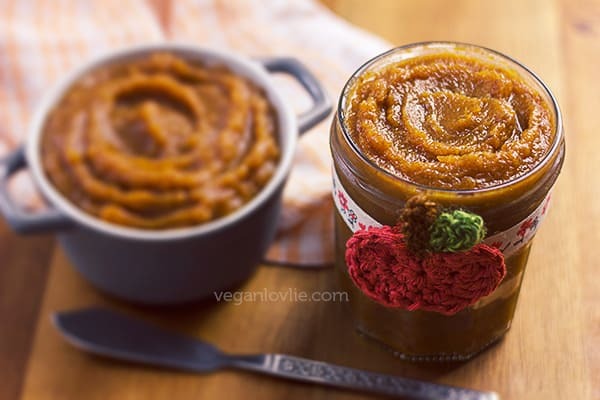 A lightly spiced and naturally sweetened pumpkin butter with dates, no added sugar. This butter is great smeared on toasts, crackers, pancakes, added to porridge or incorporated in other sweet treats. 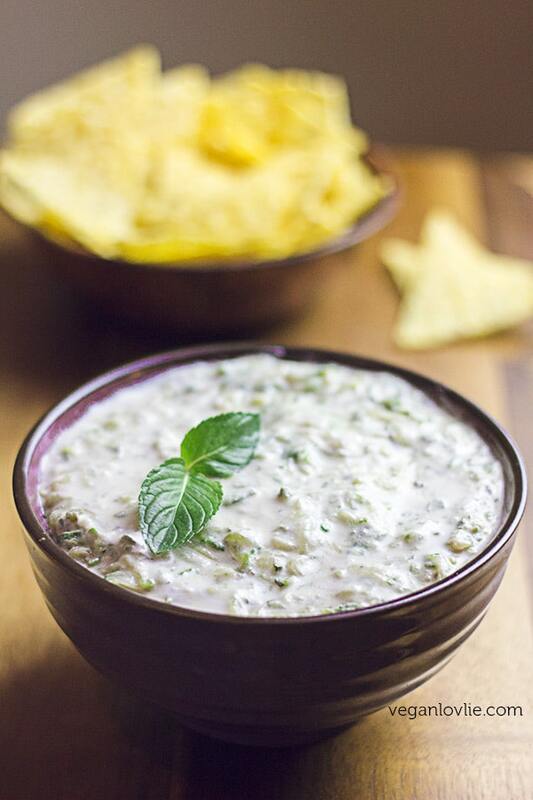 Chilly temperatures beckon warmer dishes; luscious morsels to snuggle the belly and cozy us up. Growing up in a tropical country with only two seasons and little seasonal variation of temperature, I don’t recall paying much attention to colder weather seasonal dishes. In fact, summer bounties — garden-grown and local tropical fruits — were more often awaited with much anticipation rather than winter produce. After more than 15 years spent living in countries with colder winters, I’ve grown quite fond of the seasonal fall and winter produce. And I have to say, colder weather — although probably not a -40 °C Canadian winter — agrees better with me. My love for baking contributes greatly to this but mostly I find the cooler months much more peaceful. It’s a time for renewal and spending more time with myself indoors. Apart from cooking, I love spending time crafting, painting, crocheting and watching Japanese animes. If I had a sewing machine, I’d most probably be sewing too. Mushi-Shi is one anime that I very much enjoyed during the winter months just cuddling up under the duvet with a hot mug of chocolate and cake. The soundtrack is blissfully soothing. Spices find their way in my recipes irrespective of seasons. However, the intricate combination of certain selected spices does evoke the taste of the season. And right now, I am talking about none other than pumpkin spice; its ubiquitousness around this time of the year just cannot go unnoticed even for non-adepts of the cult. 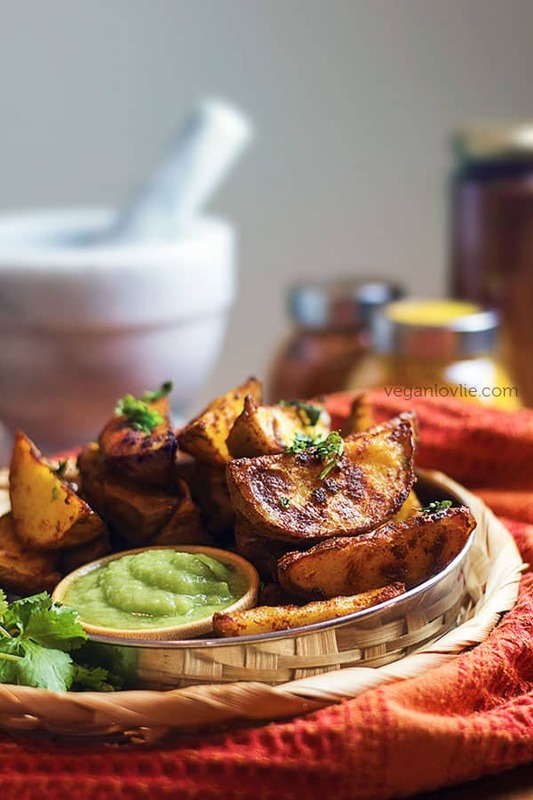 Beyond pumpkin-spiced pumpkin foods, I am used to enjoying this creamy mildly sweet vegetable mostly in savoury dishes. Although, I do love them in a sweet rendition too like this chocolate pumpkin loaf cake I made a while ago. I find that the sweet taste tend to accentuate the spices. That is probably why I find the commercial pumpkin-spiced anything to be overly spiced, despite my fondness for spices. For my homemade sweet goodies, I keep it rather subtle on the spices and big on the pumpkin. What I like the most about this vegetable is the sheer size. One fairly medium-sized pumpkin provides for several meals with plenty of leftovers. Making pumpkin butter is a great way to use up the extras. 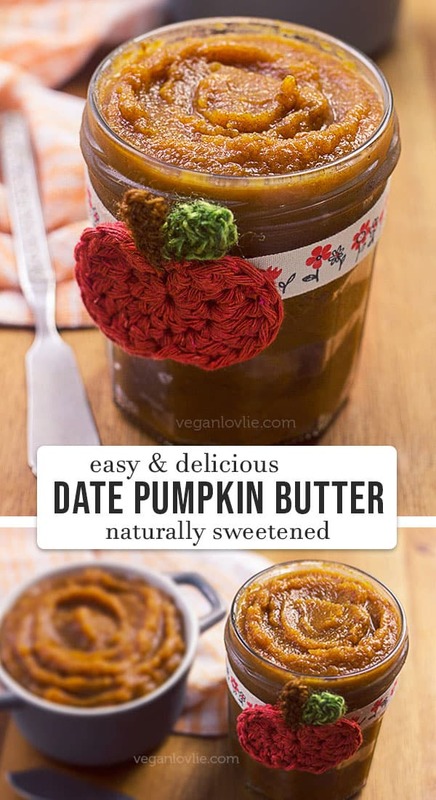 Like fruit butters, pumpkin butter does not contain any butter. Fruit butters are in fact simply fruit cooked with sugar and sometimes spices. They usually contain less sugar than jam. Hence their texture is closer to that of a reduced puree rather than the jelly-like consistency of jams. Butters are much easier to make compared to jams or jellies. 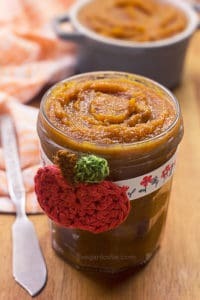 Sweetened with dates, this spiced pumpkin butter calls for fresh pumpkin rather than canned pumpkin puree. With the abundance of fresh pumpkins lying around in the stores at this time of the year, it would be a shame to see them go to waste or just being used as Halloween jack-o’-lanterns decorations. 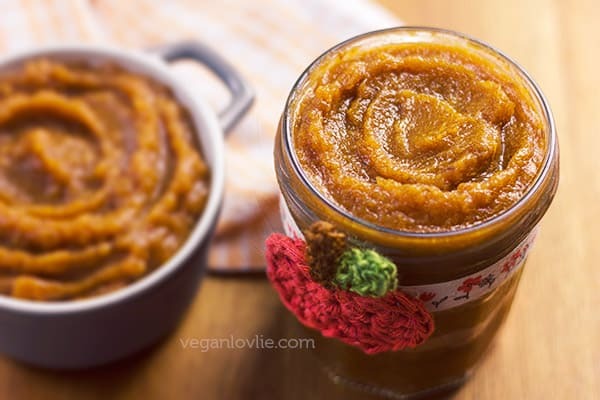 This recipe can be made with canned pumpkin puree (not pie filling) though if you wish. 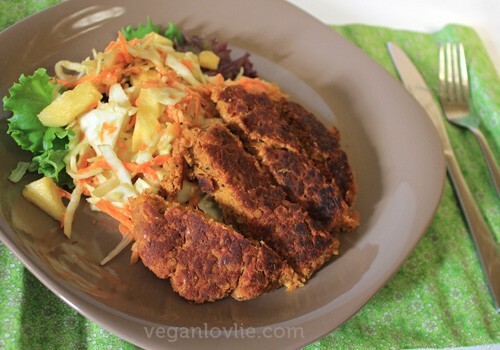 Just substitute the fresh pumpkin and proceed as per the recipe; it will take less time to cook. The distinctive sweet sourness of tamarind adds an interesting complexity to the soothing spicy flavours of this butter. The dates that I am using are the Perny variety. Medjool dates are also good. You may need less if you are using Medjool dates as they are larger and sweeter. I preserve this butter in the refrigerator for about 3 weeks. They can be frozen or kept in sterilised jars to preserve them for longer. This butter can be used on its own, smeared on toasts, crackers, pancakes, added to porridge or incorporated in other sweet treats. Or you can give it away as a gift in a nicely decorated jar. Stay tuned for upcoming recipes using this pumpkin butter. 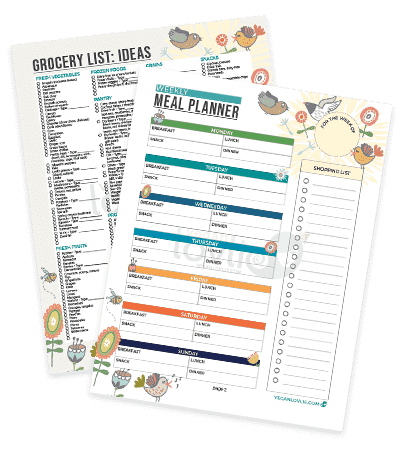 We’ll be sharing some ideas about how we’ve been using it in our What We Eat series too. On a side note, I made the cute crochet pumpkin that you see attached on a ribbon to the jar. This makes a nice jar decoration if you want to give this butter away as a gift to someone. I am going to be doing a giveaway for these crochet pumpkins jar decorations soon. I might be making them into mug cozies too. I will be announcing the giveaway on my Instagram where it will be hosted sometime next week. There will be more than one winner. So make sure to follow us there to find out about the rules and how to enter. This is just a thank you gift from us to you. *Watch this video tutorial on how to deseed tamarind. Place the tamarind paste in a little warm water to soak. Once soften, mash it between your fingers to remove the seeds. We have another video on the channel where we have showed how to do this. Check the link in the description if you want to watch it. If you are starting off with a whole pumpkin, cut it in half first. Using the tip of a thin flexible knife, insert it through the skin and move it across all around. Once cut, remove the seeds using a spoon or ice cream scoop. Save the seeds. They can be roasted and eaten as a snack. Cut a few slices off one half of the pumpkin. Remove the fibrous centres by cutting them off. Then peel each slice. I find it relatively easy to place the slice on the board so the skin side is perpendicular to it. Then run the knife under the skin starting from the top towards the board. Rotate the pumpkin slice as you follow the curve of the pumpkin with the knife (watch the video above for how to do this). Cut the pumpkin into small pieces. Then measure out about 2 cups or about 360g. Peel the pear. Cut it into quarters and remove the seeds. Then cut into small pieces. Add the pumpkin, pear and dates to a saucepan. Then add in the diluted and deseeded tamarind paste. Next add in all the spices – the cinnamon, nutmeg, ginger and a pinch of all spice – and a pinch of salt. Add about one cup of water. Stir and mix everything well together. Cover and simmer on a low medium heat for about 20 minutes. Occasionally check on it and stir or add a little water as required so that the mixture does not stick to the pan. Once the pumpkins are soft, blend the mixture using a hand blender directly into the pan. You may alternatively transfer everything to a blender and process until smooth. Then return the puree into the pan and continue cooking. Allow the mixture to thicken for another 5-10 minutes. At this stage, it is up to you how much you want to reduce it. The more time you allow it on the stove, the more the flavours will deepen. It will also become darker in colour and thicker in consistency. Transfer to a jar or container and store in the fridge for 2-3 weeks. This pumpkin butter can be frozen or kept in sterilised jars to preserve them for longer. Can I sub or leave out the pear?